"Feel free to close your eyes." One is not often told that at the theater, and while I do occasionally do that, it's usually due to sleep deprivation and not to enhance the experience of theater. But Shade's Brigade is a unique theater experience. 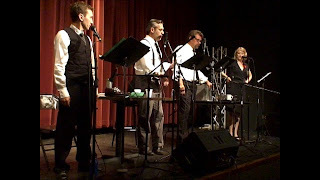 It's a serialized radio play that you can watch live, but that you can also listen to (for free) on www.ShadesBrigade.com. I saw Episode 3 last night at the Jerome Hill Theatre in St. Paul and listened to Episode 1 today online. As fun as it is to watch live and see how the story is created, there's something to be said for experiencing it the way it was intended - as a purely auditory experience. Shade's Brigade is a noir thriller about Captain Jack Shade and his team of colleagues who travel the world having adventures, getting into scrapes, and solving problems. Episode 3 involves a stolen painting that needs to be returned to the museum from which it was stolen, but the mystery is really not as important as the characters and how they go about solving it. All of the actors have great and expressive voices (and do their own sound effects! ), but they also put on an entertaining performance for the live audience, despite standing behind music stands with scripts. 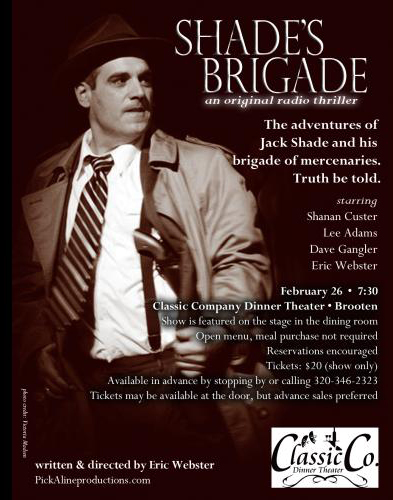 Eric Webster, who wrote and directs the plays, is Captain Shade, and also narrates in that classic noir style. He's joined by Dave Gangler as the proper Brit, Lee H. Adams, who effortlessly switches between two outrageous characters, the good old Southern boy Cooper and the tough but dumb Ernie, and the delightful Shanan Custer as Kate, former Air Force Pilot and Girl Friday type. They're joined for Episode 3 by local radio personality Brian Turner as a Frenchman who runs into the gang. The cast has a variety of props onstage to create the sound effects, from a squeaky door to a train. Going to see Shade's Brigage is a little like watching a broadcast of A Prairie Home Companion, where you get a peek behind the magic. Or you can close your eyes and just listen, and let your imagination paint the pictures you hear. Take a listen on their website (each episode is roughly an hour), and if you like what you hear, you can check out one of two monthly performances through November (more info here, discount tickets available at Goldstar). I will definitely be keeping up with the Brigade online to see what they get into next!